No recipe today, no recipe needed. It's all about fresh homegrown apples being made into apple cider. There is only only two ingredients: apples and muscle! Have you ever wanted to press your own cider? If not, you will after this. I joined a family who have lived on a farm near my parents for quite some decades. 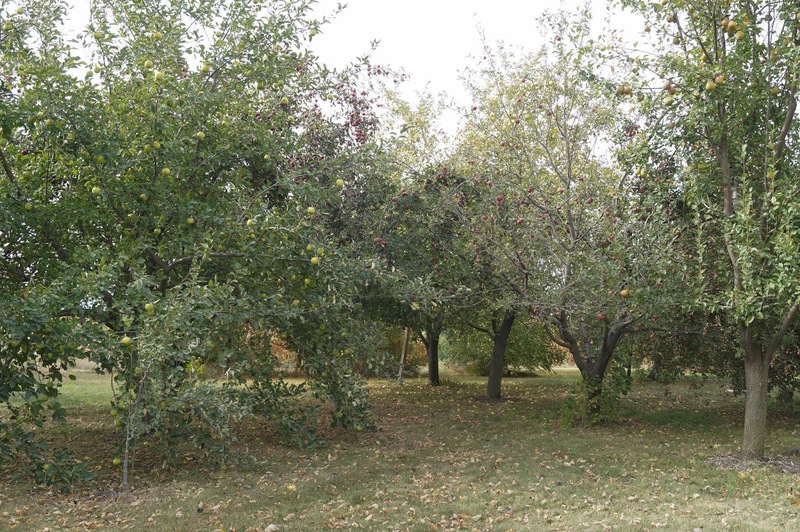 They have a lot of apple trees on their farm. One day my dad stopped to see if they used them all since I was looking for apples to make sauce with. You would be surprised how many people don't use the fruit on their trees and if you just ask they will let you have the fruit. This family said they use their apples for cider but I could have some to make sauce. They would call when they were ready. Time had passed and the wife called. She said they were going to be making cider and I could come pick apples for my sauce. I had already found another source for apples meanwhile so we had our applesauce needs filled. This cider making peaked my interest and so I asked if I could join them. She said yes. It was a windy day in Iowa but still beautiful. Not hot, not cold. 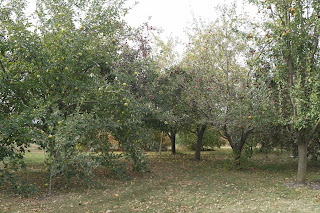 First we picked several varieties of apples. They included Grimes Gold, Red Delicious, Macintosh, Yellow Delicious, Red Rome, and Winesap. It's not uncommon for the father to climb the tree but today they used a tractor with a pallet on it. 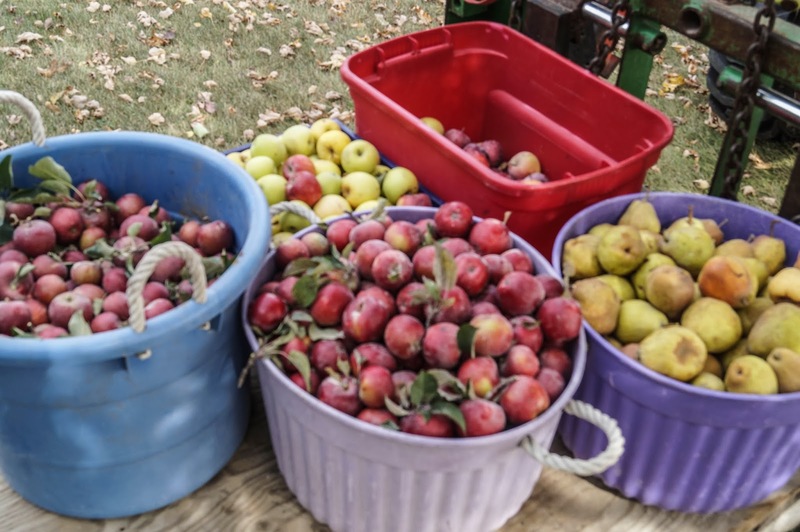 He used his apple picking pouch to gather the apples into and then dump into the buckets. Gorgeous orchard! Apples were plentiful in Iowa this year. In our picking, we ran across an apple that had a bloom end on the side. Normally they are opposite the stem but this guy grew crooked. Giving the apples a shower! and the grinder at work. This is what the apples look like after they're ground, but before they're pressed. The barrel starts off full to the brim of apples and by the time the pressing is done it's down to half. The cider runs out the end. I missed a picture step in here where the mom and daughter-in-law strain the juice into these clean jugs. I am pretty sure it was because I was in awe of how she could do it into a small funnel and not spill any. We pressed each apple type separate and marked the jugs with the name. Then we tested each flavor and found which ones were fine as is, which ones needed toned down, and which ones need a lot of flavor boost. It also helped determine which ones we wanted to pick more of to process. I am not a huge cider fan and really wished my husband was there. He's a true cider connoisseur. I don't know how many pounds of apples we did but it was a lot! They gave the leftover pressings to a neighbor. She feeds them to her horses. We ended up with almost 40 gallons worth of cider. They freeze theirs and I canned mine in half gallon jars since I don't have freezer space. I thought it was interesting how the color went from a darker brown to a lighter color by the ended of the canning. Thanks again to the family for allowing me to come over and make cider. It was a fun learning experience! Thanks for stopping by. I had a lot of fun making it and it was a good experience. PLUS, I have cider for the winter! Great fun for kids to see how foods are made. I love cider! and I'd love to have you share this on The HomeAcre Harvest Hop today! I apologize, Blogger did not alert me to this particular message so I missed your hop. Maybe next time! Hi Jenny! I have been to your blog numerous times, but didn't realize until tonight you were from Iowa. I am an Iowa native, now just a few miles over the border into Wisconsin. Following you now via Bloglovin. Ah yep! My family is from this little corner of Iowa and I grew up here most of my years when I wasn't traveling around since dad was in the Army. This looks delicious. I knew a 6th grade teacher that made cider with his class--he brought in some cool equipment and was letting the kids turn cranks and help him. This is a great post. Sometimes we don't really appreciate how much work there is to making something that seems simple. Thanks for sharing your experience and the cider looks so good too. Pinning/sharing.